Wait! Hold up bandwagon! I’m coming! I’m late? Oh come on! I live in the Midwest, so cut me some slack, it takes us awhile to catch up on the trendy stuff. 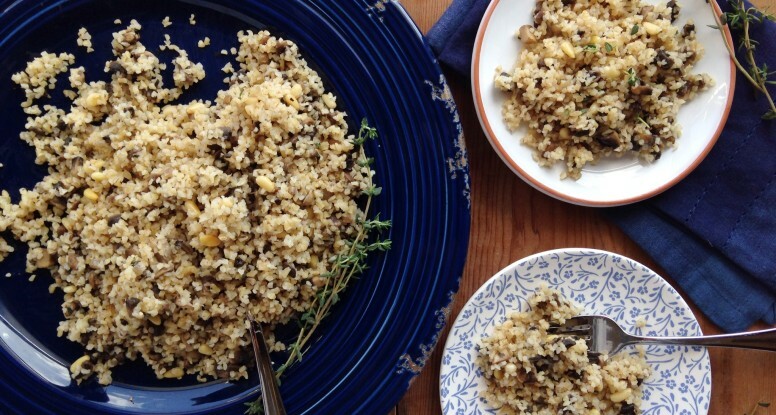 Please, oh please can I jump on the cauliflower rice bandwagon? Busy girls (and guys)! Attention please! I’m super excited to share some really fun stuff with you today. Just what am I sharing? I’m so happy you asked! 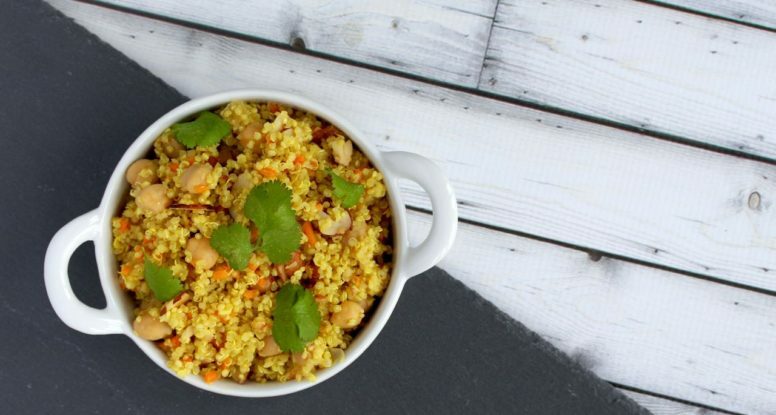 In today’s post, you’ll find the following: A fast and fun recipe: my CURRY BULGUR BOWL and tips on nourishing yourself – I’m calling them Nourishing Reminders. Intrigued? I thought so! Catch the recipe and my tips below. Fancy a few superfoods? 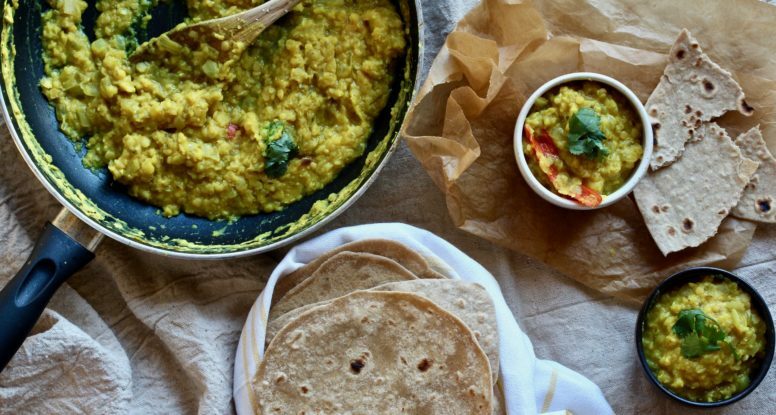 Well, then you need this Chickpea Turmeric Quinoa Bowl! When you’re a food that’s lumped in the category of “super foods,” you must feel pretty fantastic. There’s likely plenty of publicity and notoriety along with hoards of people flocking to get your autograph. Ok, maybe it’s not quite like that, but I sure love the idea of food celebrities, don’t you? Kale and blueberries slipping into limos while shielding their eyes from the flash bulbs of the paparazzi. Fun! The Fertility Friday series celebrates the mighty mushroom. Thank goodness this little fungi is a fertility-friendly food. 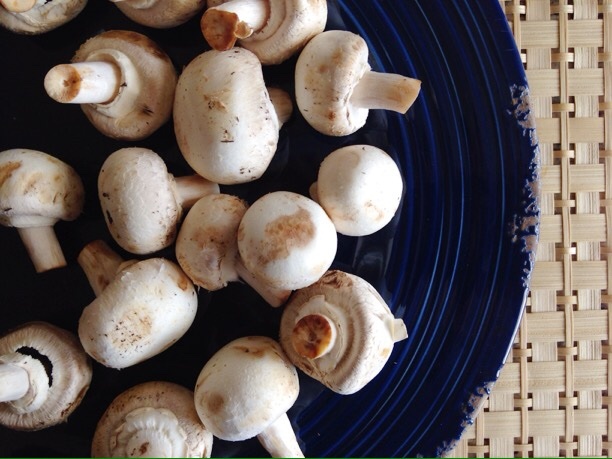 Mushrooms boast some powerful nutrition – think Vitamin D, selenium and B vitamins such as riboflavin – all nutrients that are beneficial to fertility. In fact you can head on over to Shaw Simple Swaps to learn more about Vitamin D and selenium! 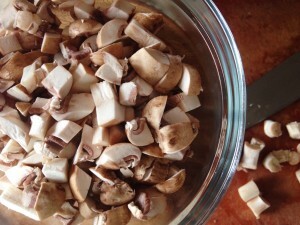 But before you go, learn why I think you should include more mushrooms in your diet (even if you’re not struggling with infertility!). 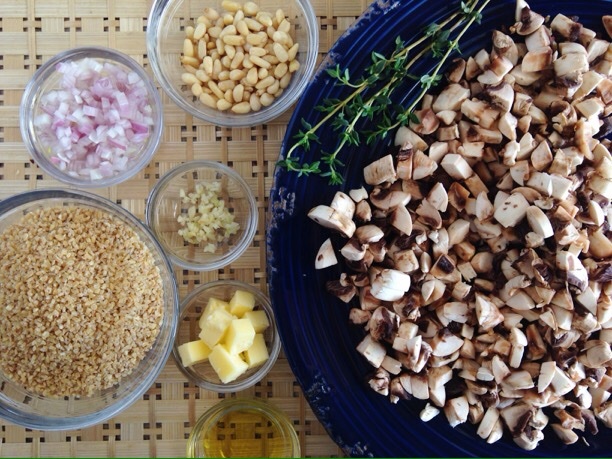 I’ve got a super simple recipe that starts with delicious sautéed mushrooms and ends with fresh thyme and toasted pine nuts! Yum! 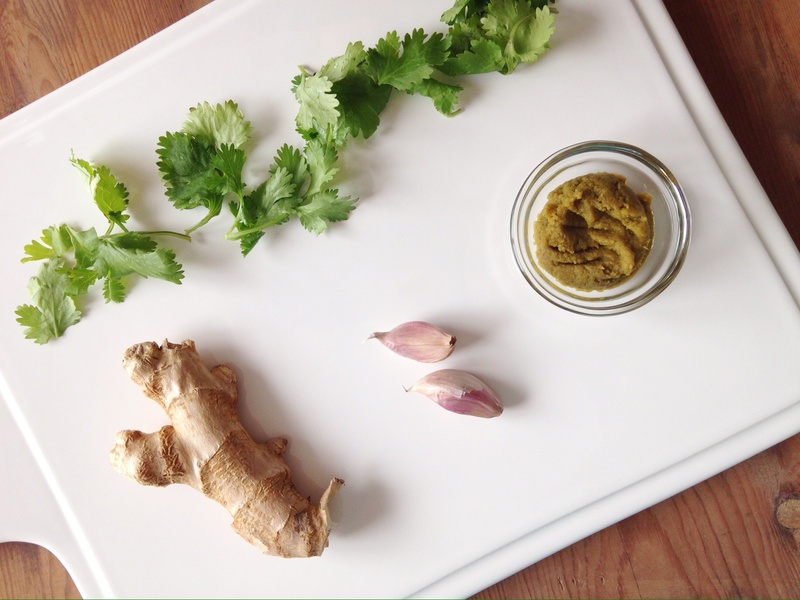 Let’s focus for a moment on an underlying theme present in most of the foods and recipes we recommend for fertility. 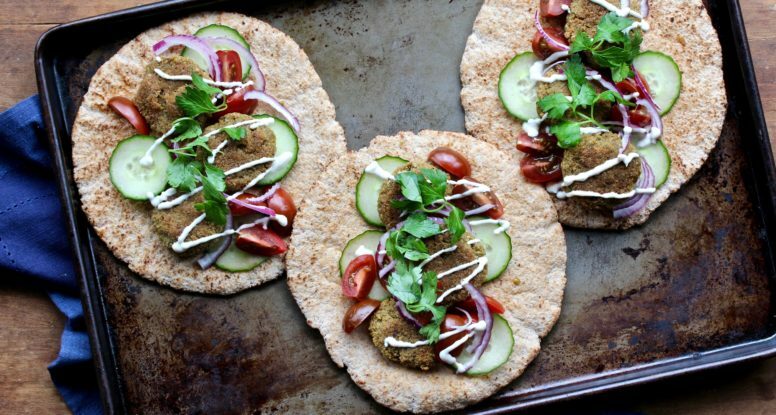 That theme is the power of a plant-based way of eating. The research shows that eating more plants is a great way to nourish and fuel your body for fertility. Plant foods contain a variety of vitamins, minerals, antioxidants and other nutrients, all of which play a role in making you the most healthy version of yourself, while also preventing chronic disease. 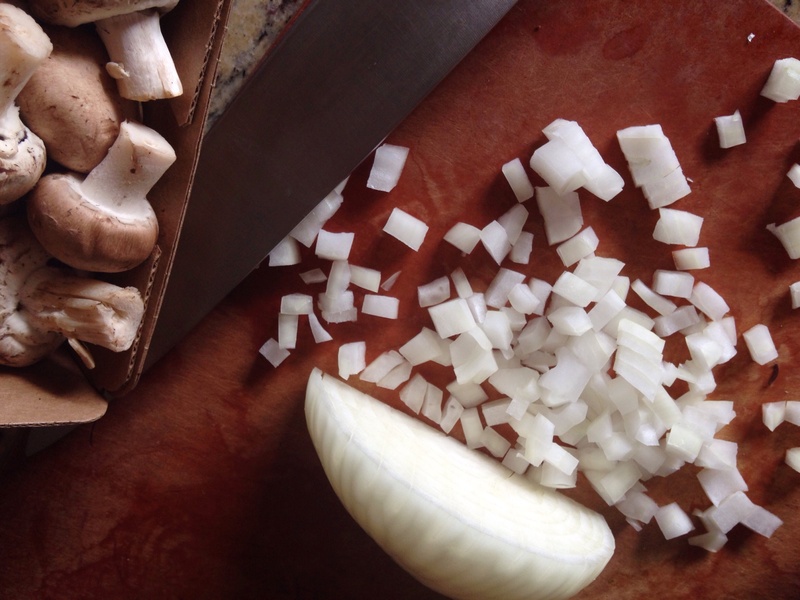 And mushrooms, while fungi, make plant-focused eating easy. Flavor. Remember my mention above about each variety of mushroom having it’s own unique flavor? The flavor difference is actually quite amazing and is something many people don’t take advantage of. 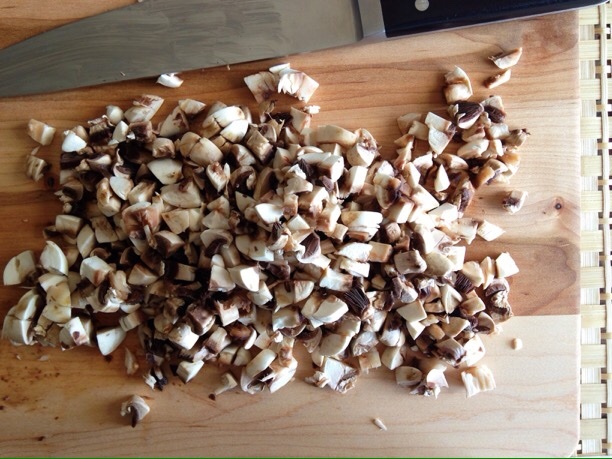 Cremini mushrooms, for example, have mineral and earthy tones, while shiitakes sharply boast that umami savoriness. Think about how that flavor can boost the flavor of other foods too. Think how amazing sautéed mushrooms taste! That taste means you might need less fat or salt, both of which we don’t necessarily need more of in our diets. 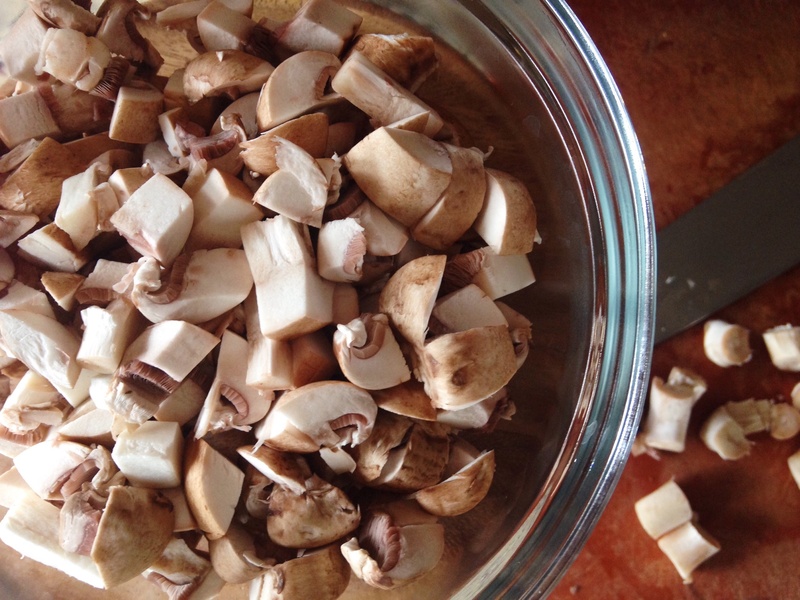 Next time you’re at the grocery store, don’t forget to add mushrooms to your cart. Besides nourishing and fertility-friendly, they’re loaded with satisfying umami, adding interest and flavor to your nourishing fertility-friendly plant-focused way of eating. Oh and before I forget! For my meat-lovers, have no fear! I’m not saying forgo meat, no way! It has a place on the fertility-friendly food list. But I figure we could all use a little more encouragement when it comes eating more plant-based foods. Feeling lost? RESOLVE is a non-for-profit that helps people dealing with infertility. They’re a great resource and can even connect you with people in your area going through the same thing. You’re not alone! Feeling inspired? Why not be apart of National Infertility Week and share your blog posts, tweets and Facebook posts about your journey. Use the hashtag #startasking to make it easy for people to follow you on social media. 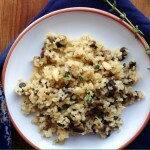 Finely chopped mushrooms sautéed until golden then tossed with bulgur, fresh thyme and pine nuts. 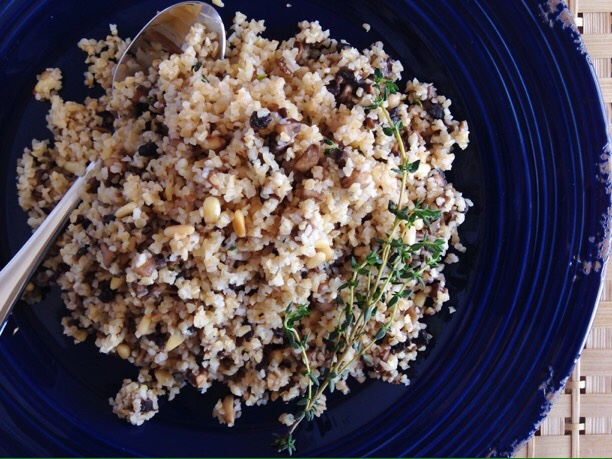 Place bulgur in a medium bowl. Add 1/4 teaspoon Kosher salt, then cover with boiling water. 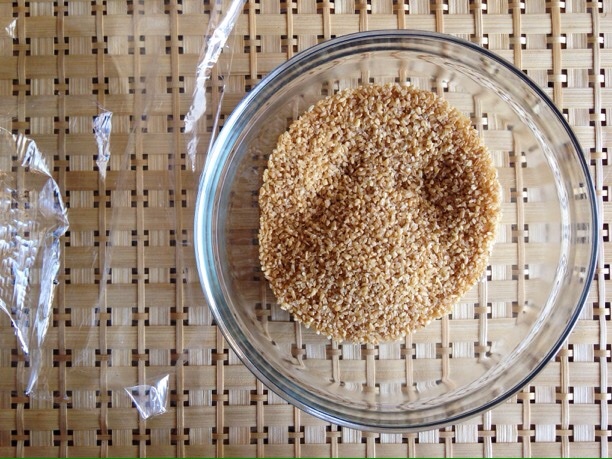 Immediately cover the bowl with a piece of plastic wrap and let bulgur steam for about 20 minutes. Heat a skillet over medium-high heat, add the pine nuts and toast, stirring occasionally until lightly browned, about 3-4 minutes. Remove from pan and reserve. Turn heat down to medium, add the olive oil and butter to the skillet. Once butter has melted, add the shallot and saute until softened, about 2-3 minutes. 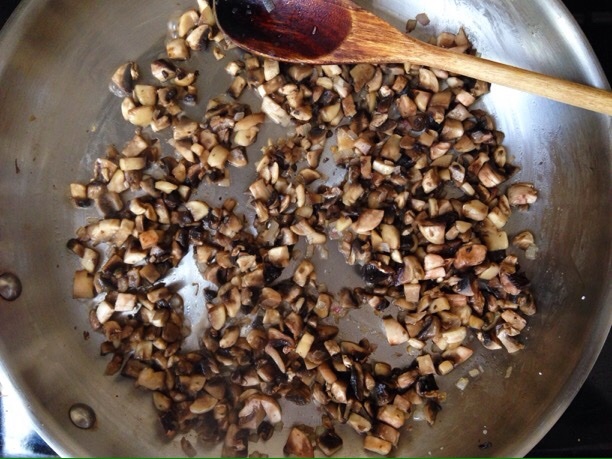 Increase heat to medium high, Add the chopped mushrooms and a sprinkle of salt and continue cooking another 5 minutes. 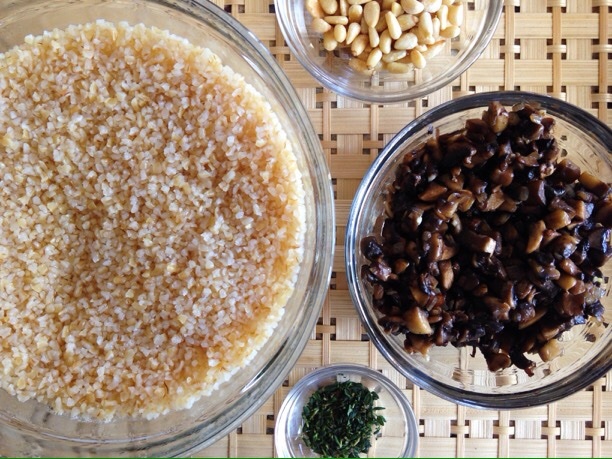 Remove plastic wrap from the bulgur and drain any excess liquid. 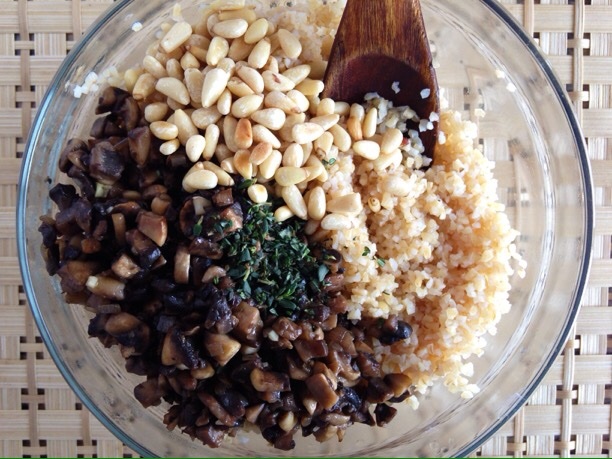 Add the mushroom mixture to the bulgur along with the toasted pine nuts, black pepper and fresh thyme and stir to combine. Garnish with extra thyme if desired and serve. It’s time for a new recipe! And here it is, the Short and Sweet (this is what I am calling my new abbreviated, get-to-the-point recipe blog posts) version! 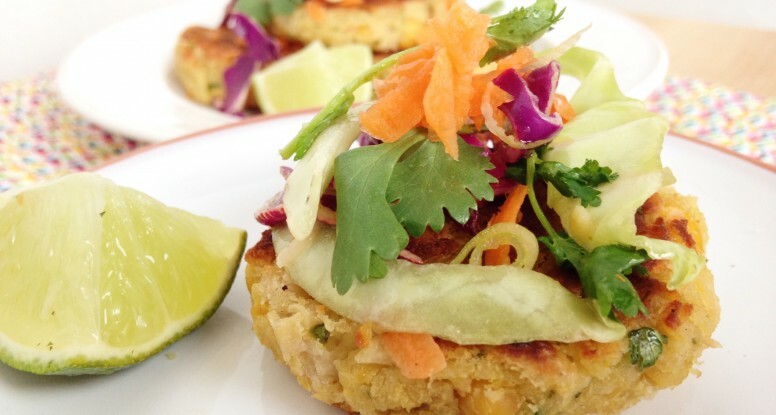 Why I made this recipe: Because I love Thai food and I adore veggie burgers, so why not combine them? Why I love this recipe: Because these little chickpea burgers are super flavorful, satisfying and with the lime-infused slaw, taste so clean and refreshing. 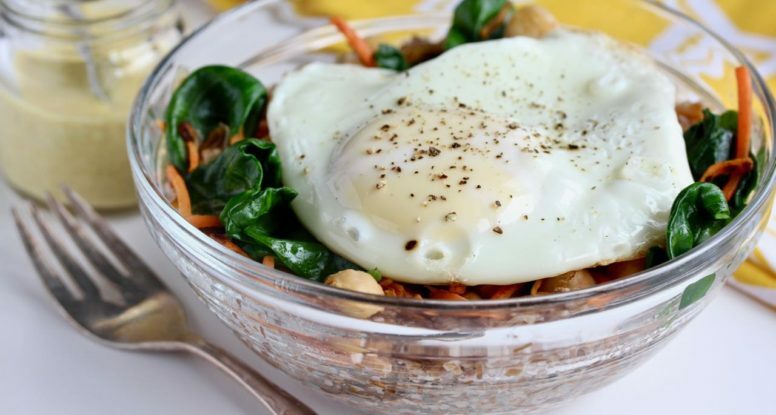 How this recipe is healthy: I’m sure I don’t have to tell you this, but Americans don’t eat enough fiber. Getting enough is a tall order considering the average adult needs between 25-35 grams of fiber each day! One easy way to get more fiber is to eat more beans. Beans can help fill your “fiber bucket” to the tune of about 8 grams per half cup, and these burgers make it easy. And there’s more! Besides fiber, beans are also a superb source of lean vegetarian protein and they offer other goodies like folic acid and iron. The beans are great, but so is the slaw, which is made with fresh veggies including cabbage and carrots then tossed in a light lime-infused vinaigrette. 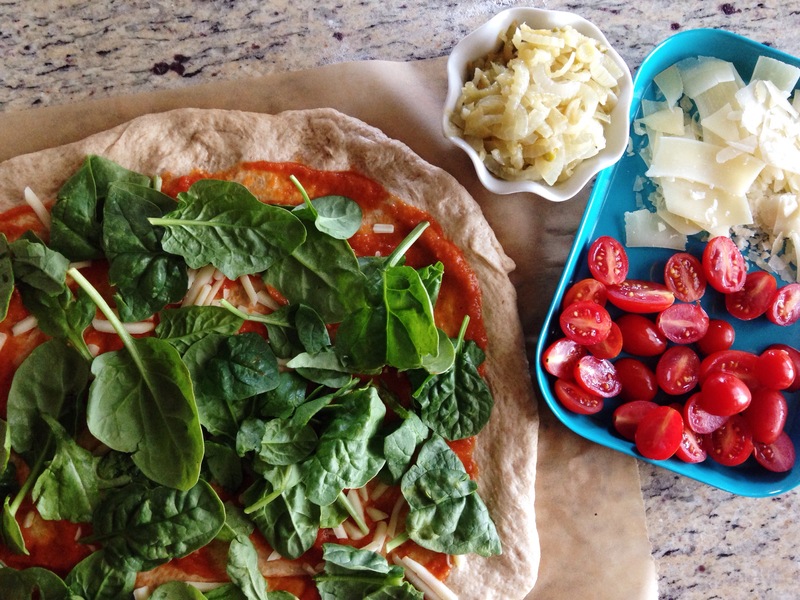 It’s a nutrition-packed, satisfying meal! 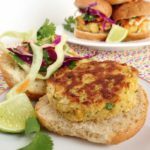 A chickpea burger that’s bursting with fresh garlic, ginger and Thai Green Curry paste then topped with a refreshing lime-infused cabbage slaw. 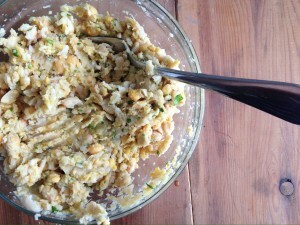 Combine the mustard, lime zest and lime juice together in the bottom of a medium mixing bowl. Gradually add the olive oil, whisking until incorporated. 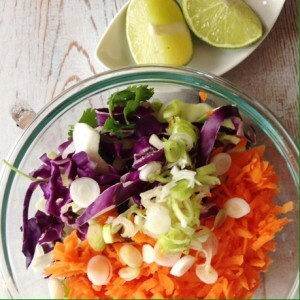 Add the cabbage, carrot, green onion and cilantro and toss to combine. 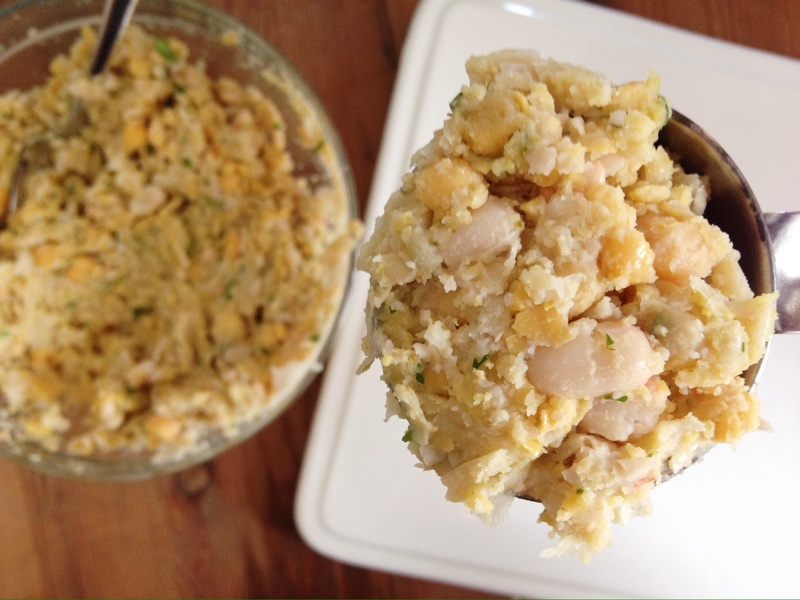 Place beans in a large mixing bowl and partially mash with a fork or avocado (or potato) masher. In a separate bowl, whisk the egg together with the olive oil, cilantro, curry paste, ginger, garlic and salt. Add mixture, along with the bread crumbs, to beans and stir to combine. Using a 1/4 cup measure, loosely scoop out the bean mixture and shape into patties. Heat half of the olive oil in a non-stick pan set over medium heat. 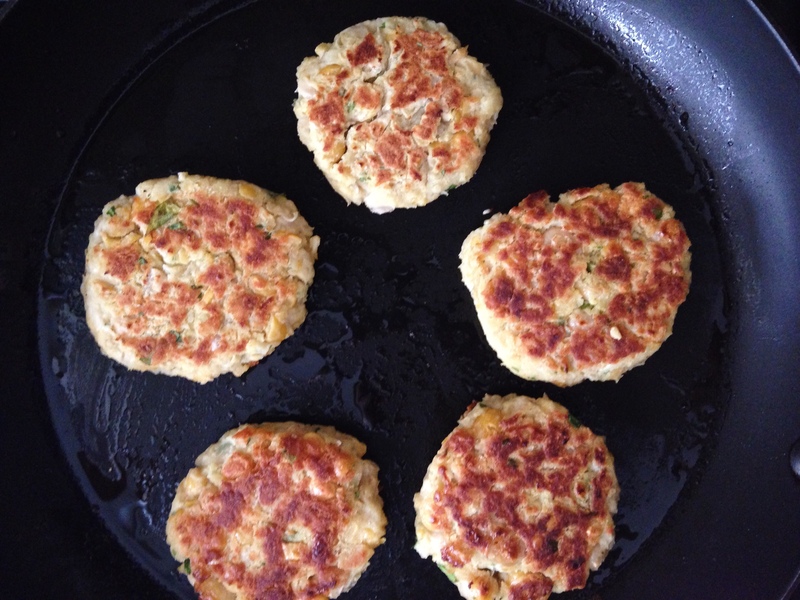 Add half of the patties and cook for about 5 minutes. Carefully flip them over and cook an additional 5 minutes. Remove the patties from the pan and cover with foil to keep them warm. Add the remaining oil and repeat the process with the remaining patties. 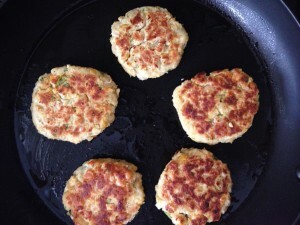 Place the cooked patties on the toasted buns and top with a rounded 1/4 cup of the slaw. Serve immediately. Attention vegans and others with egg and gluten allergies! 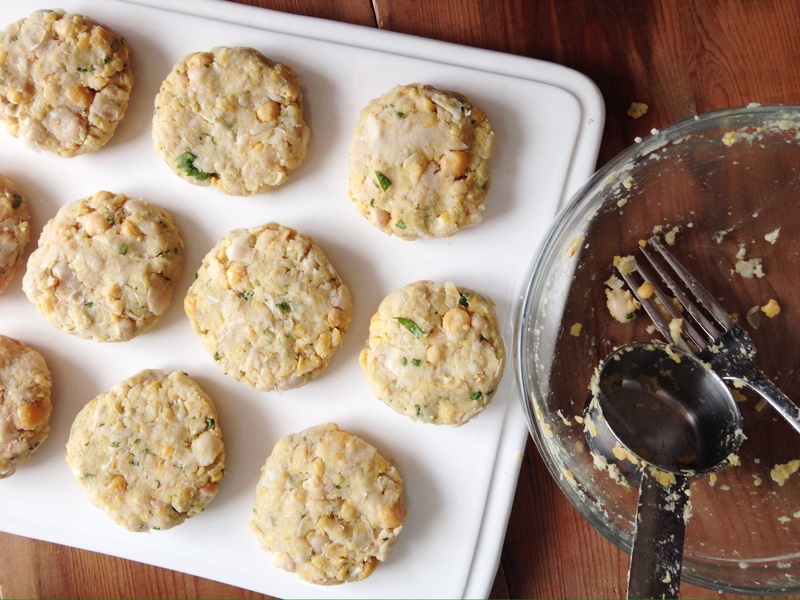 You can make these without the egg and breadcrumbs. Simply omit them and follow the instructions as written. The burgers will be a little crumbly, but still super tasty. And enjoy the burger sans bun or opt for a GF bun for all you gluten sensitive folks. Yields about 10 mini burgers. I adore tacos. Besides pizza, no other food is better in my opinion. I love tacos because they are the perfect vehicle for so many other great foods. Just think about it. Tacos are delicious filled with grilled chicken and a simple pico de gallo. 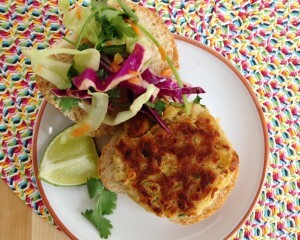 They are also fantastic loaded with spicy oven-baked tofu and a refreshing cilantro cabbage slaw. And how about fish? I mean, who doesn’t love a fish taco? 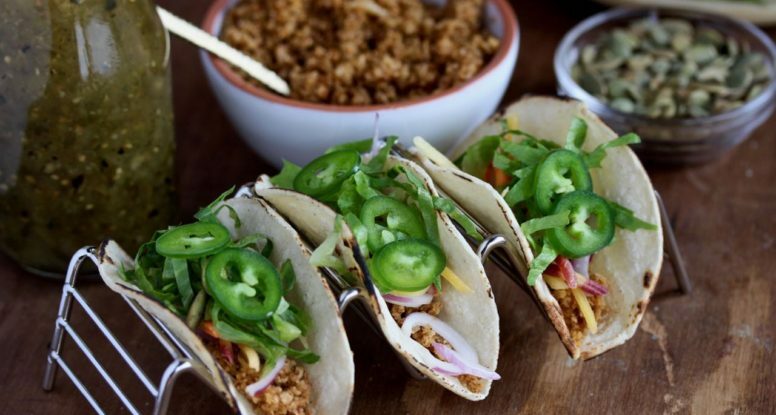 In my house, tacos rule and I am constantly finding new fillings for my favorite food. To honor “Meatless Monday“, I came up with a vegetarian taco recipe that earned two thumbs up from my little family. 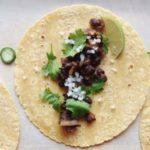 These black bean and mushroom tacos are bursting with flavor and umami, so even if you’re a meat-eater, you won’t miss the meat. They are simple to make and many of the ingredients can be prepped the day before so that all you have to do is cook and serve. You’re welcome! 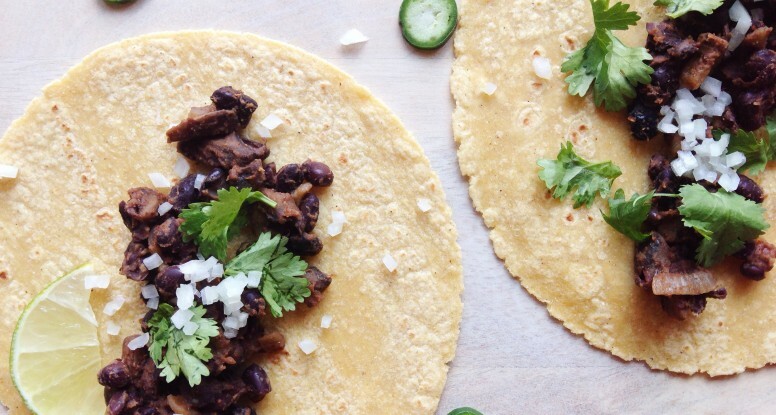 Besides being simple and delicious, tacos are also a great, healthy option for any meal. Use a whole grain tortilla and fill it with lean meats or beans and top with plenty of fresh produce like sautéed peppers, shredded kale or romaine lettuce, chopped tomatoes and thinly sliced jicama. Or why not fill it with last night’s veggie stir-fry or leftover quinoa and grilled corn? Be creative and have fun with your tacos! The options are truly limitless. 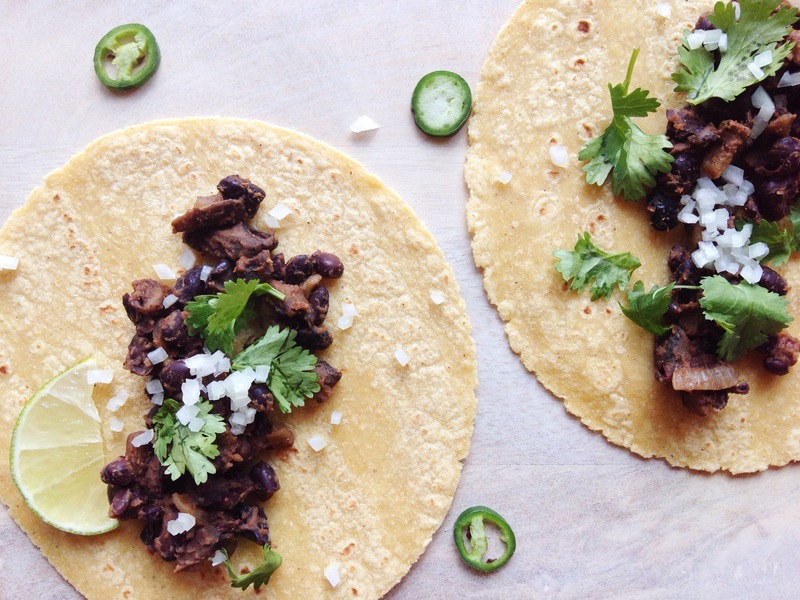 In the mean time, try these black bean and mushroom tacos. 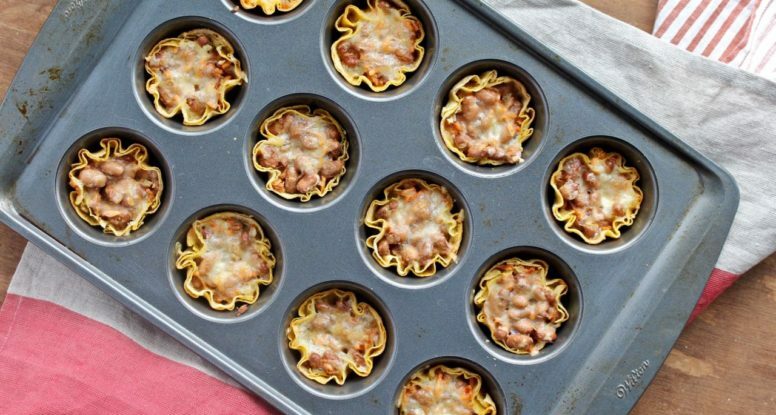 They’re sure to make your Meatless Monday meal a success! Perfect for taco night! A delicious sauté of mushrooms and black beans makes the perfect filling for tortillas. Heat a skillet over medium heat. Add the oil and the onion and cook 5 minutes, stirring frequently. 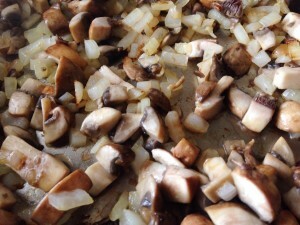 Add mushrooms and cook, stirring until golden, about five minutes. Season with salt and add the garlic, cook 1 more minute. Add the spices, stirring to toast them and prevent them from burning, another minute more. Stir in the black beans, water and lime juice and cook 3-4 minutes, until most of the liquid has been cooked off. 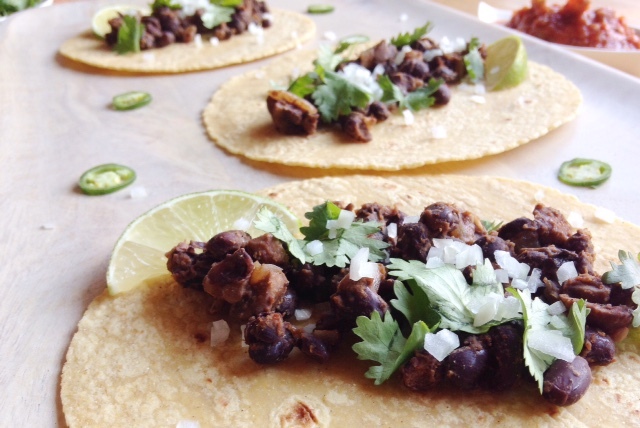 To serve: Fill each tortilla with about 1/4 cup of the black bean and mushroom sauté. 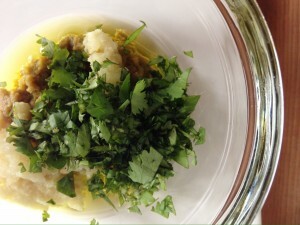 Top with cilantro and onions and serve. Everyone has a favorite food, right? Mine just happens to be pizza. I mean, is there really another food that’s more perfect? Doughy crust, tangy, tomatoey (yup, I’m using that word) sauce, divine vegetables all topped with flavorful, umami-bursting cheese? Yes, please!!! Thus, the birth of the caramelized onion and fennel pizza. As a food-lover, it’s a dish that constantly pleases me. 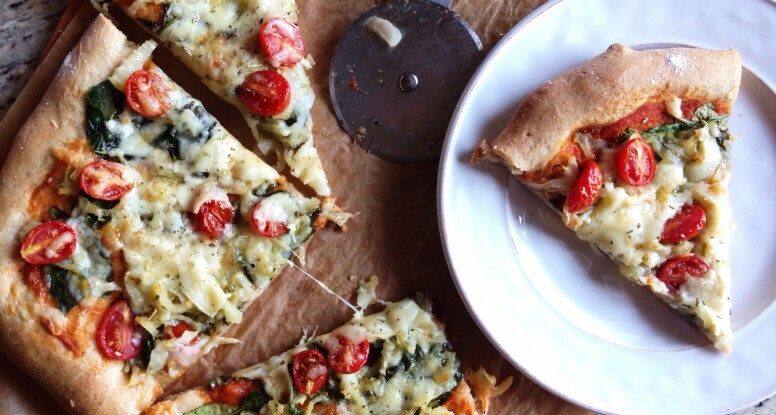 From the myriad of toppings to the simplicity of a delicious pizza crust, it’s an ever-evolving food that can surprise, yet also elicit the feeling of familiarity and comfort. 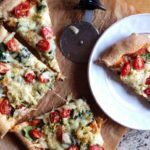 The dietitian in me, loves that pizza is the perfect platform for the wide assortment of delicious, nutritious foods out there. The combinations of those foods is almost limitless. 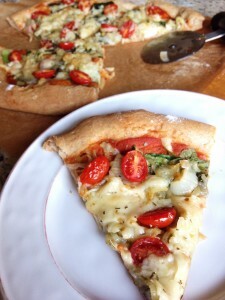 I love whole wheat pizza dough topped with wild mushrooms or an array of broccoli, tomatoes, onions and peppers. Heck, you can even put fruit on top or what about grilled barbecue chicken or Thai-style pizza with cilantro, jalapenos, carrots and peanuts? See what I mean? I’m always trying new things on my pizza and since I happened to have some extra fennel laying around, I decided to try that on my pizza. Caramelizing it with some onion, brought out a delicious sweet flavor and tasted amazing with fresh tomatoes and spinach. It turned out to be a winning combination that even my 2 1/2 year old loves. Try it now and let me know what you think! Slow cooked onions and fennel make the perfect topping for pizza! Coat a large bowl with non-stick cooking spray, remove dough from packaging and place inside. 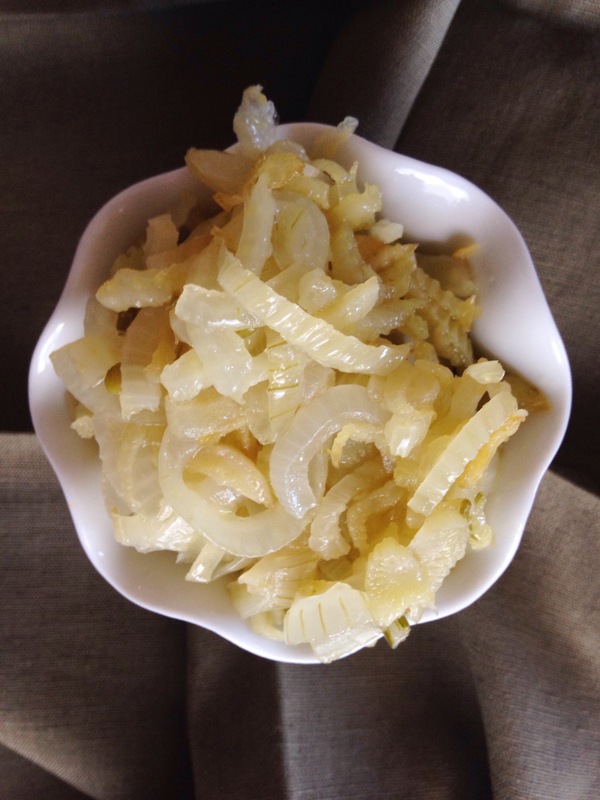 Cover the top of the bowl with plastic wrap and rest on the counter while you prepare the caramelized onions and fennel. Heat the oil in a non-stick skillet over medium heat. 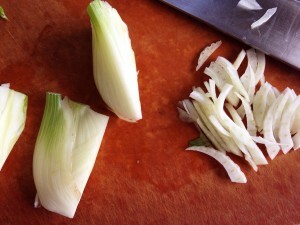 Add the onion and fennel. Cook, stirring frequently for 5 minutes. Turn down the heat to low and cover with a lid or foil. Cook until onion and fennel are tender, stirring occasionally, about 35 more minutes. Remove from heat and season with salt. Dust your counter or other clean work surface lightly with flour (any flour will do). Remove dough from the bowl and place on your work surface. 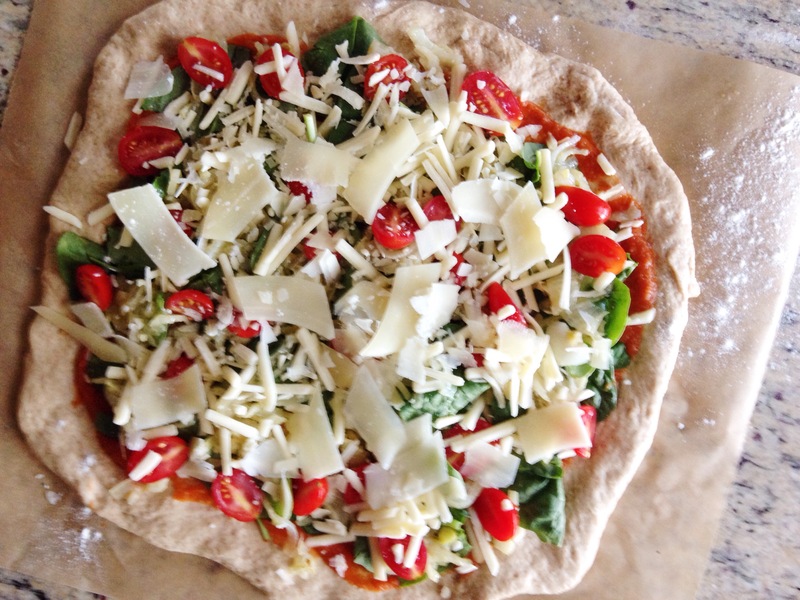 Using a rolling pin or your hands, shape dough into a 12-inch circle. 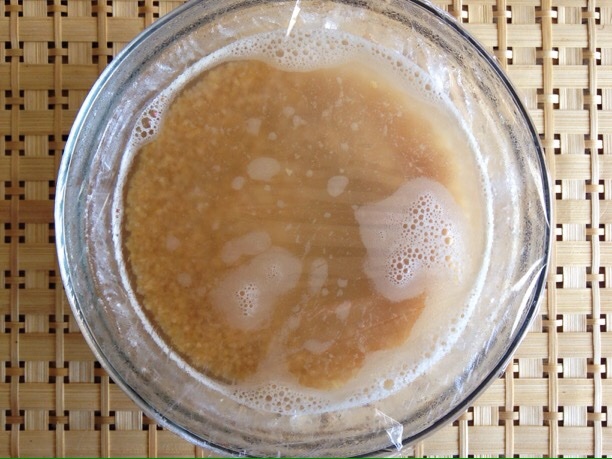 Transfer dough to a piece of parchment paper. 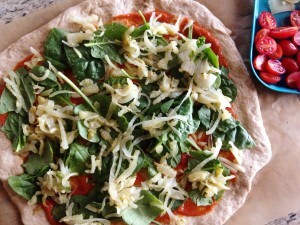 Spread the pizza sauce over the crust and top with the spinach, caramelized onions and fennel, tomatoes and the cheese. Sprinkle with Italian seasoning. 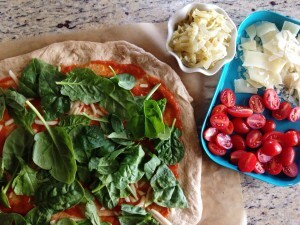 Keep the pizza on the parchment and either transfer it to the oven directly onto a pizza stone or set it on an inverted cookie sheet before placing in the oven. 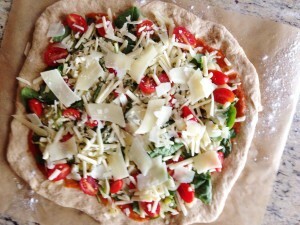 Bake for about 15 minutes, until cheese is melted and crust turns golden brown. Remove from the oven, cut and enjoy!